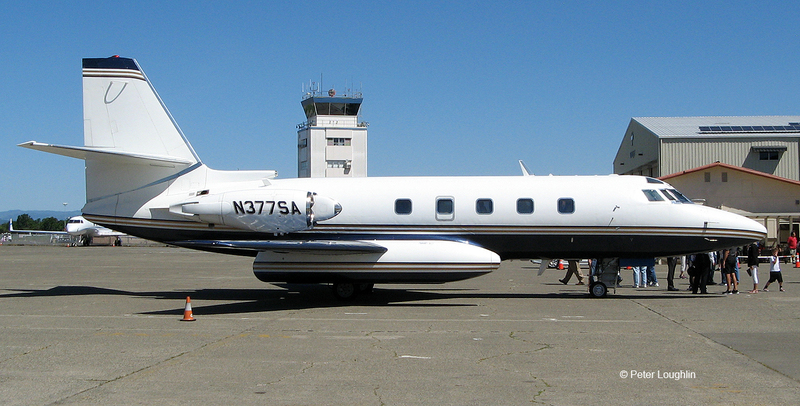 The Lockheed Jetstar was the first jet aircraft designed specifically for business use. This is the Museum's Jetstar about an hour after it made its final landing at the Charles M. Schulz-Sonoma County Airport in April 2016. Its unusual four-engine configuration is obvious in this photo. Business jets have a reputation for luxury and the Jetstar seems to prove the rule. The plush interor of Jetstar N377SA accommodates ten in great comfort. Not surprisingly, Elvis Presley owned one very similar to this. The Lockeed Jetstar is all business, from tail to nose. 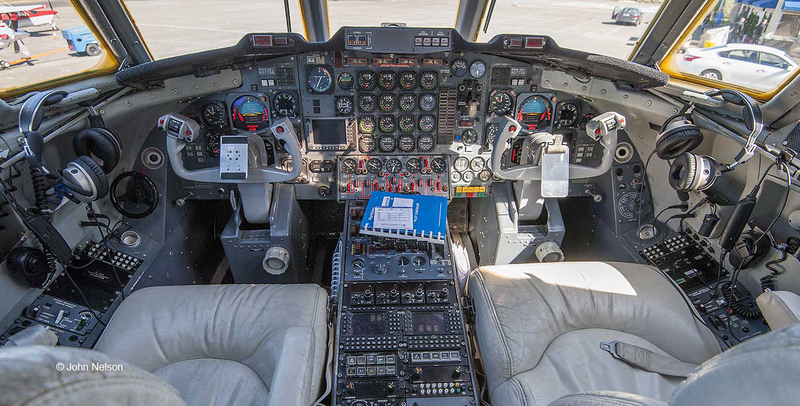 Here's the front office, where the pilot and copilot sit. 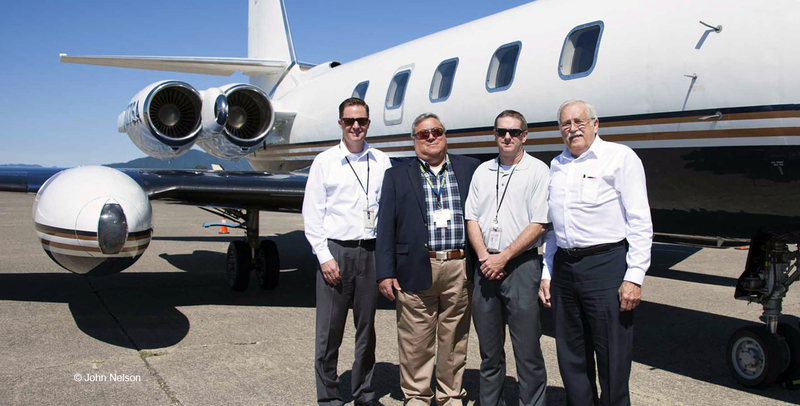 Here is the Jetstar's final crew, who flew it to the Charles M. Schulz-Sonoma County Airport for retirement at our Museum. 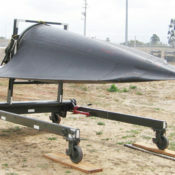 The big pod hanging under the wing is a "slipper tank" fuel tank. 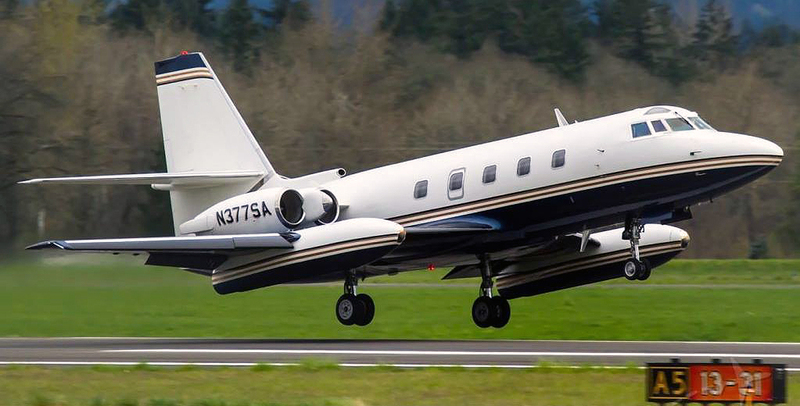 Lockheed Jetstar business jet N377SA makes a low pass down the runway, before approaching and landing one final time. The Jetstar was designed in the late 1950s and was the first dedicated business jet. 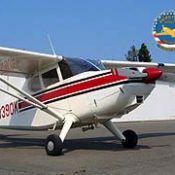 Before that, wealthy business people bought and converted airliners for their own uses, or flew as commercial airline passengers, or flew older and slower piston-engined aircraft. Our Jetstar was donated by a generous and anonymous contributor. 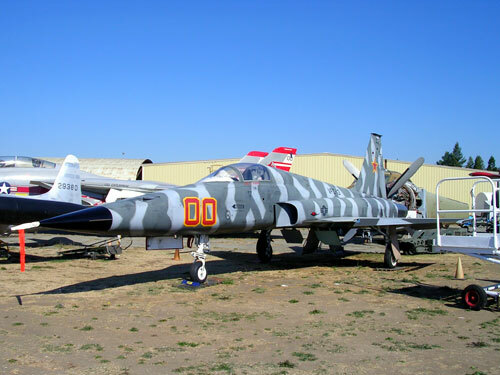 PCAM is extremely pleased to have this pivotal aircraft design in our collection. 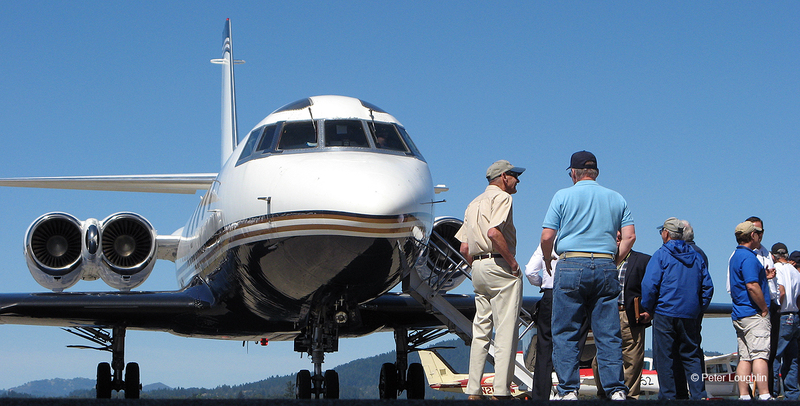 It was the pioneer business jet, which opened up an entire market sector for other aircraft manufacturers. 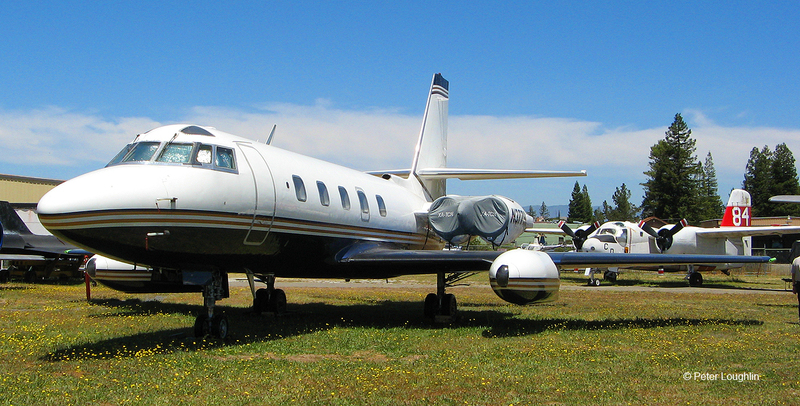 This is the Museum's Lockheed Jetstar, shown during its business life. Here, it is just about to touch down at some unknown airport, carrying its payload of businesspersons. Many Jetstars were owned by private businesses, and even the Air Force used them as VIP transports and as airborne test aircraft for testing navigational aids. 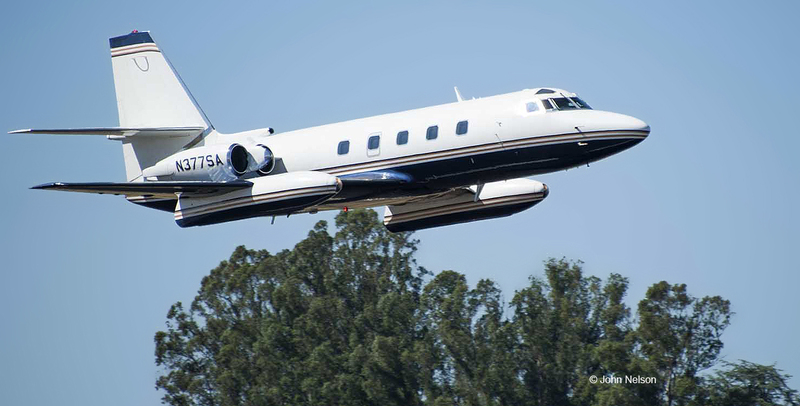 Lockheed Jetstar business jet #5229 (N377SA) arrived at the Pacific Coast Air Museum on Saturday April 30, 2016 as the newest addition to the Museum’s collection. 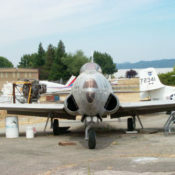 The aircraft was showcased at a reception at Sonoma Jet Center on Saturday morning and is now on display at the Museum. The Jetstar is an executive business jet produced in the 1960s and 1970s by Lockheed Corporation (originally the Lockheed Aircraft Manufacturing Company). The Jetstar has the distinction of being the first dedicated business jet to enter service, was capable of cruising at over 500 mph and had a range of nearly 3,000 miles. 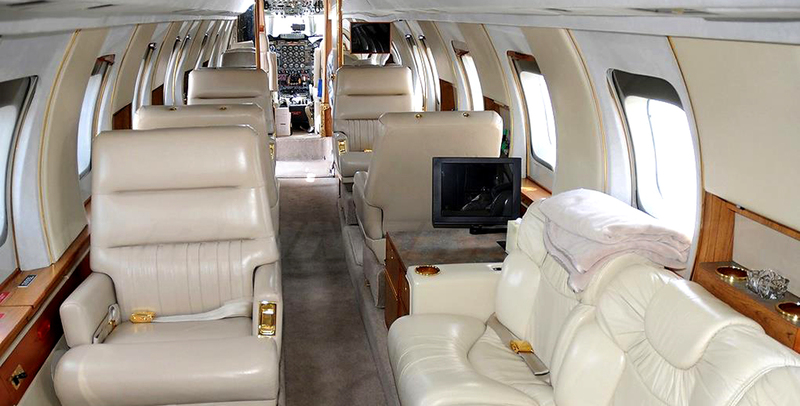 It is a relatively large business jet that seats up to 10 passengers and a crew of two pilots and one flight attendant. Jetstar N377SA was manufactured in 1978, has been privately owned and operated for private business transportation and is being donated to the Museum after its final flight. 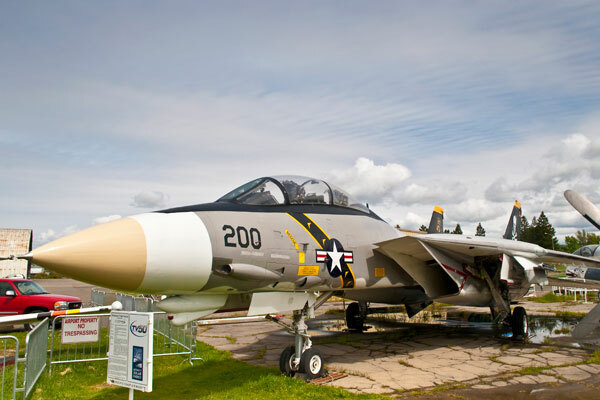 The Museum plans to have the aircraft on display as early as May 1, 2016. 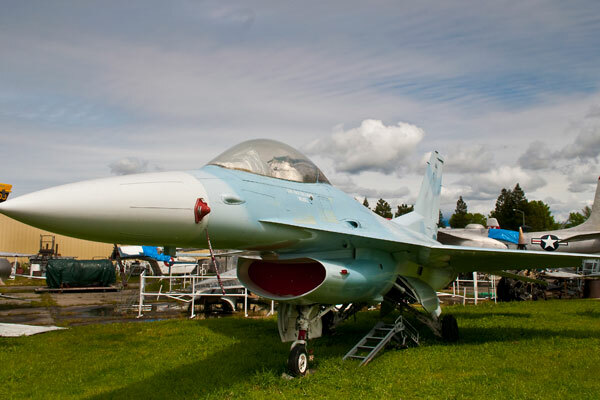 With the generous support of Top Speed Data Communications, a valued partner of the Museum based in Petaluma that specializes in voice, data and wireless services, PCAM will develop an exhibit that allows Museum visitors to see inside this piece of aviation history. Our goal is to make this exhibit ADA accessible so that all of the Museum’s visitors have the chance to come aboard.